We’ve seen tons of videos where dogs and their humans are reunited after being separated for a long time or under harrowing circumstances. This dog was under no such condition, but don’t tell her that. She looks like she went through a lot. Her human (actually, just one of them) was gone for nearly 36 hours. However, that’s practically ages in dog time. 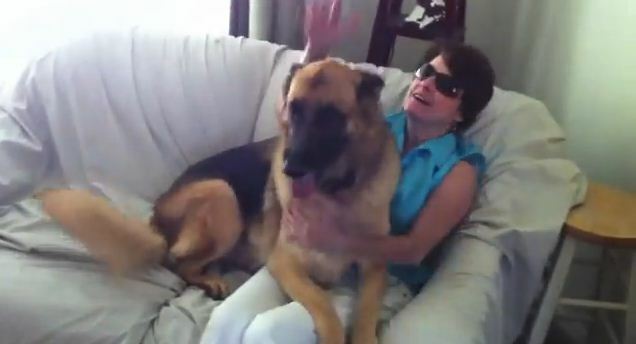 Watch their adorable reunion, in which this very large German Shepherd reverts to bouncy puppy mode when her mama returns. This shows you that when someone loves you as much as a dog does, it doesn’t matter how long you’re gone—it’s still too long. No matter who you are, how big you are, or how old you are, nothing beats seeing a loved one after a period of time apart. Also, dogs have pretty weird bouts of separation anxiety. They don’t mean any harm by it, but it can get a bit overwhelming(ly cute).